On a secluded lot high above the Parkway! Get your romance on “under the stars” at the Hanky Panky Cabin. Couples will love the hot tub on the deck after a full day of outdoor adventure in Gatlinburg and the Great Smoky Mountains - here’s a couples tip: Take a hand-in-hand stroll along the Little Pigeon Forge branch. The upstairs sauna is a great choice too if you’re winter vacation includes Ober Gatlinburg Amusement Park & Ski Area (skiing and snow tubing are available). This small cabin can take on a romantic dinner no problem. The fully equipped kitchen allows you to cook a romantic meal together. If you decide to go out for dinner, you are just a short drive to downtown Gatlinburg and all types of cuisine - for a real romantic dinner, make a reservation at Christopher Place’s Mountain View Restaurant (candlelight, fireplaces, mountain views, you get the idea). If you can’t get enough of the outdoor mountain air and alone time, then fire up the charcoal grill just off the deck. Sleeping arrangement: Bedroom is on the main level with king size bed and adjoining bath. Most cabins in Gatlinburg have electric fireplaces. That’s not good enough for the Hanky Panky Cabin - this living area has a real snap & crackle wood burning fireplace for that extra touch of romance. The cabin is high above the parkway of Gatlinburg and has Mountain/Ober Gatlinburg Tramway views. With so many unique “couples” things to do, you’ll be glad you book directly with us at Chalet Village. Our friendly loves to help guests plan the most romantic Smoky Mountain getaway ever, no matter what season you visit. But there are also many ‘not so famous’ couples oriented destinations: Iris Theater, Sugarlands Riding Stables, A Taste of Gatlinburg Walking Tour brings you to 6 local eateries, plus you’ll get a little history lesson of the town. 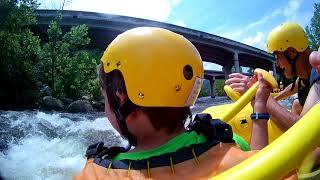 Wine tasting on Rocky Top Wine Trail, Great Smoky Mountain Wheel, Whitewater rafting on the Big Pigeon. If you and your beloved do only one thing in the Smoky Mountains, make sure you step onto a hiking trail. We recommend the sweet reward of a 100-foot Cascading waterfall at Ramsey Cascades Trail. Some of the most breathtaking views for hiking in the Smoky Mountains are found at the Mt. Cammerer Trail (you’ll be on the Appalachian Trail for the majority of this hike). Remember to pack a bottle of great wine and some snacks.